Experience the surreal sensation of floating on a freezing river on this private 1.5-hour ice-floating adventure in Varkaus. Slip into a thick, rubber waterproof suit, get instructions from an expert guide, and jump into the ice-cold waters of the River Pirtinvirta to float like a cork. With your suit keeping you warm and dry, drift gently downstream and enjoy the winter scenery and overwhelming sense of calm and relaxation. After your floating session, savor a complimentary hot drink on shore and perhaps buy a souvenir photo (own expense) or two. 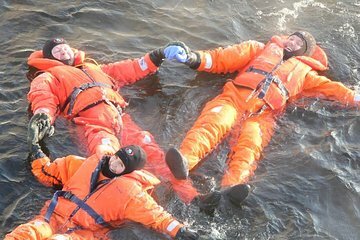 You will use Ursuit Onesize rescue suits when floating, and eight suits are available: (one for people between 130-160 cms tall, five for people between 160-190 cms tall, two for people over 180 cms tall. Depending on your size, one to five people can participate at the same time).